The Maximus is the first choice of diving professionals and now its even better. It can be adjusted to match or exceed the freeze-up resistance of the Blizzard or the moisturizing effectiveness of the Oasis! The ideal choice for advanced, professional, cave and wreck divers, Maximus is an extremely compact and comfortable レギュレータ that's big on performance. 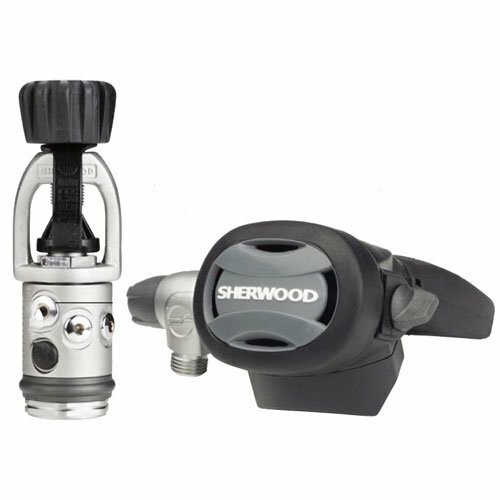 Great for all diving environments. Ever notice how tired your jaw muscles are after a day of diving Sherwood did. And they did something about it in designing the Maximus レギュレータ. First, they tucked the hose under your arm to cut down the sideways push and pull on your second stage. The result It sits more comfortably in your mouth. Another plus the underarm hose gives you a more compact, snag-proof profile. So it's ideal for cave and wreck diving, and gentler on the environment. Grooved hand wheel is easily grasped wet or dry. The dust cap protects internal parts from contaminants when not in use. Flexible cover with purge feature. Simple to operate: just push down on the front cover to release air. Side adjustable venturi assist gives you easier breathing at high flow rates. Right angle swivel reduces jaw fatigue. Wisdom mouthpiece for reduced jaw fatigue.